Rivera ... reminiscent of Mediterranean settings. 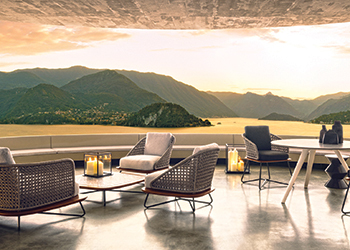 Minotti from Italy has launched its Rivera Outdoor Collection, which represents a contemporary interpretation of retro elegance reminiscent of a typically Mediterranean ambiance. The product brings the comfort and elegance of the interiors to the outdoor space, while being resistant to sunlight and the weather. “Designed by Rodolfo Dordoni and unveiled in Milan, development of this product was driven by a desire to experiment with contrasts and unique combinations of materials for the outdoors – lightweight metal, the reassuring warmth of wood, sophisticated weaves and the amazing elegance of fabrics – all of which contribute to transform even outdoor spaces into intimate and cosy settings,” says a company spokesman. A slender handcrafted base in solid iroko heartwood supports an enveloping backrest in woven polypropylene fibre, available in light grey and dark brown colours. The “cannage” (cane interlaced strips) effect weave requires great skill and manual ability as well as tireless, patient workmanship, says the spokesman. The Rivera collection includes a two-seat sofa and a three-seat sofa, armchairs, ottoman, coffee table and chair that define retro elegance in contemporary language, using innovative materials to evoke a warm, typically Mediterranean settings, whether on a lakeside veranda or terrace overlooking the sea. A premium wood, solid iroko heartwood – appreciated for its durability and waterproof qualities – adds value to the base of the painstakingly hand-finished Rivera seating elements. The unique shape of the cantilevered wood frame that is distinctive to the 98-cm-deep armchair, as well as the two-seat sofa and three-seat sofa, allows it to be used as a table surface for glasses or other small objects. The 84-cm-deep Rivera armchairs are perfect for pairing with the two-seat sofa and can also be used in projects where space is at a premium. New Collection ... Peace from the bathroom range. DuPont Corian, a leading global brand among surfacing materials for interior design and architecture, has expanded its collections of ready-made basins for the bathroom and a general repositioning of its whole shapes offer, which also includes sinks for the kitchen and basins for the healthcare sector. The new addition are part of its ‘Endless Evolution’ growth programme. Each new bathroom basin is characterised by a versatile, contemporary design and incorporates innovative technical features. “The beauty of DuPont Corian lies in its adaptability. It is a versatile material, which can form organic or linear shapes and permits endless creative possibilities, allowing the freedom to design spaces tailored to personal tastes,” says Maurizo Solaro, marketing manager of DuPont Corian for Europe, Middle East and Africa. • Kitchens: Smooth (two models), Sweet (eight models), Spicy (five models), and Sparkling (five models). Manital of Italy has recently launched new finishes in addition to unveiling a range of handles for doors and windows. The company’s choice of finishes has now been expanded to include three new bronze finishes – black matt, dark matt and matt bronze with edges – one anthracite grey finish and one copper finish. The matt bronze with edges, he says, is suitable for models with linear and geometric forms that highlight their features. The anthracite grey finish, meanwhile, is available in matt satin and is characterised by reflections that, depending on the light, change tone becoming warmer or cooler. The copper finish is available in three versions: gloss, satin gloss or satin-matt. Manital has also unveiled its Exa handles for doors and windows, which are designed by Mario Mazzer. “Exa is an elegant and pleasantly prehensile handle, characterised by the hexagonal section shape that includes all the handle to the rosette,” says the spokesman. Made of forged brass, the handle is available in different finishes that makes it suitable any type of environment. 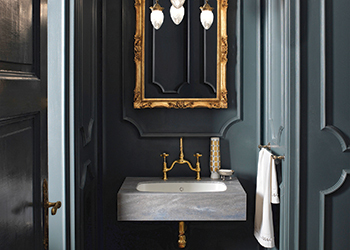 These finishes include polished brass, satin brass, bronzed brass, chrome, satin chrome, satin nickel, anthracite and SDF (super durable finish) with high performance protective treatment to maintain colour and brilliance over time, he explains.